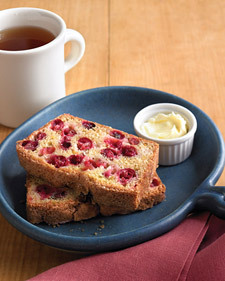 Quick breads are another favorite of mine. Here’s a perfect bread for breakfast or an afternoon snack. Recipe is from Everyday Food. Preheat oven to 350 degrees. Butter and flour a 9×5 inch loaf pan and set aside. In a large bowl, whisk together flour, brown sugar, baking powder, baking soda and salt; set aside. In a medium bowl, combine butter, egg and milk. Add wet mixture to dry mixture and whisk to combine; fold in cranberries. Pour batter into prepare pan; sprinkle with turbinado sugar if desired. Bake until toothpick inserted in center come out clean, about 1 hour and 15 minutes. Mine baked in closer to 1 hour. Transfer pan to wire rack; let bread cool for 30 minutes. Invert onto rack; then immediately turn right side up to let cool completely. I just saw this in Everyday Food and was thinking about making it. Now I’ll definitely have to!